14 classic compressors in one plugin? Yes please. MTurboComp’s Edit mode makes for a compelling headline, but it’s the versatile library of pre-made classic dynamics processors that takes centre stage. 14 excellent and diverse dynamics processors in one. Wide range of characters and sounds. Edit mode for making your own. Melda’s new flagship dynamics plugin, MTurboComp (VST/AU/AAX) is, at heart, a full-on compressor/limiter construction kit. However, for most, its main draw is probably going to be the collection of classic and vintage compressor emulations that have been made for us by the developers using its inbuilt tools. These emulations are called Active presets, and there are 14 of them, plus four totally original creations including a gate and expander. You can’t save your own custom devices into the panel as Active presets, it’s worth noting - they’re just stored as regular presets. Each emulation features all the controls of the original hardware informing it, and a standard set of further common parameters, found in the Globals, Detector and Detector EQ sections. The Globals section hosts knobs for In and Out Gain, Dry/Wet mix, and Compression and Saturation amounts. Compression increases the amount of gain reduction applied without significantly changing the final volume level, by simultaneously raising the input gain and lowering the output gain. Saturation dials in analogue-style distortion of various types, as chosen in the Editor, including soft and hard clipping, and foldback. The sound is what it’s really all about, of course, and on that front, MTurboComp is magnificent. The Detector and Detector EQ sections handle internal and external sidechain filtering and peak EQing, for emphasising or reducing the detector response to particular frequency ranges. The model-specific parameters are housed in the Compressor section, each set drawing on the expected pool of options - Threshold, Ratio, Knee, Attack, Release, Look-Ahead, etc. Although the available parameters vary between Active presets, they all essentially share the same drab, uninspiring (albeit customisable to an extent) interface. It’s a shame - we’d really like to have seen a bit more effort made in capturing the looks of the emulated boxes to go with the sounds. 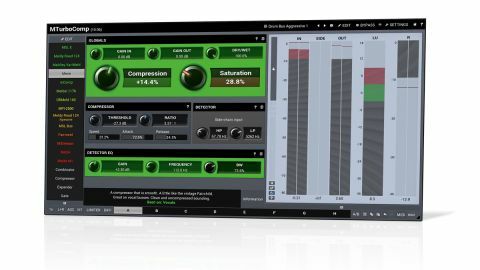 Although the Easy mode, with its 14 classic emulations, will be all most users want or need from MTurboComp, clicking the Edit button switches to Edit mode, where you can create the custom compressor of your dreams - or nightmares - using the very same building blocks employed by Melda to make the Active presets. These comprise four parallel envelope Followers, four dynamics Processors, a dynamic Equalizer and two Saturators. You can activate as many or few of them as you like, and each one offers a staggering amount of customisation, including adjustable Attack and Release response curves, RMS windows, distortion types, harmonic levels and more. It’s head- spinning stuff, but thankfully everything is explained through the use of tooltips and built-in help screens. As you’d expect, the best way to get started with Edit mode is to peruse and reverse engineer the 14 Active presets. Also, while all the common controls can be locked off, [at the time of the review] the Compressor section doesn’t hold its settings when you switch between Active presets, resetting to the defaults every time [this has been rectified in an update]. The A-H snapshots make comparison of up to eight setups easy enough, but we’d rather the Active presets retained their settings nonetheless. We’re also not fans of using percentages to indicate compression ratios and envelope times. Still, the sound is what it’s really all about, of course, and on that front, MTurboComp is magnificent. There are multiple specialists here for every production situation, from vocals and instrumentation of all kinds to bus and mastering compression, taking in a wide variety of characters and transparency levels along the way. While we can’t in all honesty comment on the precise accuracy of all 14 emulations (and Melda says “they don’t sound exactly the same” anyway), all of them behaved largely as expected based on memory, the few bits of hardware we did have available for comparison, and equivalent plugins from other developers. While the more ‘scientific’ music technologist will find plenty to get their teeth into with Edit mode, for the vast majority, MTurboComp simply stands as a comprehensive library of superb classic compressors and limiters that sound phenomenal from top to bottom, even if they don’t also look it.